Wow. I am in awe of this book. From the prologue, Laini Taylor grabs the dreamer in you through lyrical prose. The writing is so stunningly beautiful that it takes you to another world. Just the detailed descriptions of this magical world full of Gods, goddesses, Alchemy, carnage, dreams make you forget yourself and live inside it. Lazlo Strange: From the moment I started reading of him, I knew that he will be a special character in my head. Not like those swoon-worthy fictional characters but like the rough looking one who gently breezes into your heart with his smile. Strange, mich like us readers is a dreamer. he reads of fairy tales and longs for a city whose name was plucked from his mind as a kid when he played make-believe. For years he looked for the name, for the place to be real. Until finally one day, it turns out to be true. The story is a slow paced one but is necessary to have that build up and with the writing style, you won’t mind reading 500 pages to reach that end. In fact, I still crave for more. Now where the premise comes in, it is well-built and unique in itself. And the characters, well from Strange the dreamer to the godspawns and Godslayer, each character was intriguing to me. I had some thoughts about the story told from Sarai’s POV and I was so glad when the author brushed over that too. She left no loose ends. Thyon Nero, well let’s just say I hated hi, but also couldn’t help but pity him. Same goes for Minya. While it felt like Ruby and Feral were just unimportant side characters in this one, I’m really hoping they’ll have some role to play in the sequel. The author does have a knack for storytelling. I adored the tales about the Man who loved the moon, the village of Mist and the story Lazlo concocted to get the purse of silver. These tiny tales within the bigger tale were like bits of chocochips in cookies. 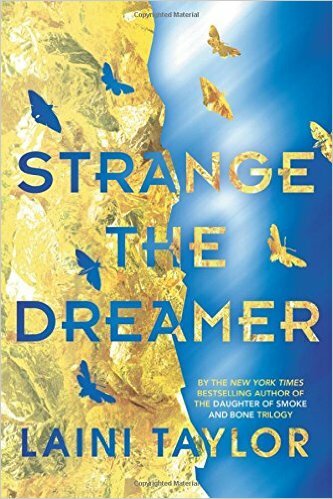 Check out Strange the Dreamer here. Guest review contributed by Alextheshadowgirl’s Blog. Using gifs and memes to bring humor to her reviews, she expands her reading to many different genres. She strives to make her reviews simple and clear and doesn’t mind if you call her a nerd. I loved this book! One of my faves of the year so far. I also loved her “Daughter of Smoke and Bone” saga. I will need to check this out! It sounds really dreamy.. hah.